It's catch up time with regards to a few different places my paintings have traveled to :) Gentle Sway in watercolors a painting of a boatman in Zhujiajiao, a Watertown near Shanghai, China, has been juried into the Virginia Artists 2018 Juried Exhibition at the Charles Taylor Arts Center in Hampton, VA. The show will run from Aug 18- October 7. My 'Thank you' to Juror Seth Feman, Curator of Exhibitions and Photography at the Chrysler Museum of Art in Norfolk, VA.
'Sunrise in the city' Honorable mention, Peninsula Watermedia Society Juried Member Show Stryker Art Gallery, Williamsburg, VA.
"Sunrise in the city" received an Honorable mention at the Penninsula Watermedia Society of Virginia juried member exhibition. The show will run May 21 -Aug 24 2018, at the Stryker Art gallery, Williamsburg, Va. I was featured on 'The Mind of an Artist' June blog spotlight at Capitol Hill Arts Workshop website: http://www.chaw.org/blog/mind-artist-part-xxviii-meera-rao. My painting above 'Haiku in Red' was in the annual Capitol Hill Art League exhibition "Winners' Circle" at the Capitol Hill Arts Workshop, Washington D.C. July 20-Aug 18 2018. Sound Reflections 2 and Sound Reflections 3 at Dr Halim's office- CHAL Juried show "Celebrate"
Two of my paintings Sound Reflections 2 and Sound Reflections 3 have been juried into Capitol Hill Art League exhibition 'Celebrate' and the show is at Washington D.C. July 13-September 7 2018. I received this photo of my painting "Magnolia" done in direct watercolor freshly matted and framed in its new home in New York state :) I am so happy it is bringing joy everyday ! "Our Town" was an Art Exhibit and Sale at Frame of Mine Gallery at Washington D.C. curated by Photo Artist Karen Cohen. It showcased affordable DC Themed art by 10 Women Artists. My two painting "Gift of Friendship" - painting of a Pagoda and Cherry Tree (Blossoms) - the famous gifts from Japanese citizens at the Tidal Basin, DC and "Tulips" hung there July 2- Aug 2 2018. Resplendent watercolor on Yupo at Artist's Choice, Capitol Hill Art League, Washington D.C. I had pulled the painting "Resplendent" out of it's frame and redid a part that was bugging me. I was then happy to have it grace the walls for the Capitol Hill Art league annual Members only Artist's Choice show June 14 - July 14 2018. 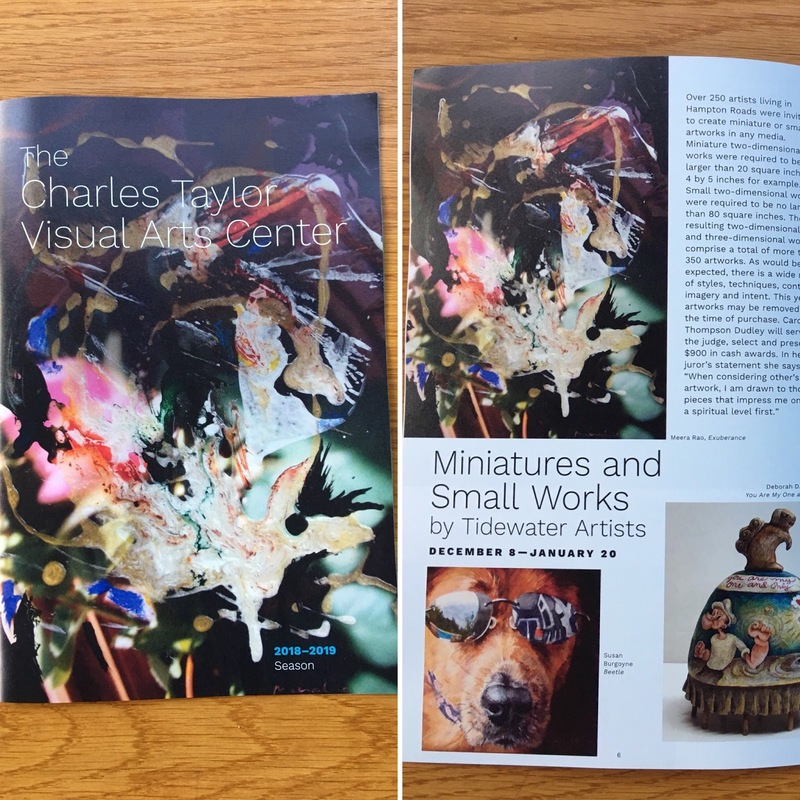 A pleasant surprise was in the mail in early June : My painting "Exuberance" is on the cover (and also inside highlighting Miniatures and Small works by Tidewater Artists) of the Hampton Arts Charles Taylor Visual Arts Center 2018-2019 season booklet with calendar of events. I am very grateful for all the opportunities to showcase my art! Hi Meera, I am impressed immensely with the wonderful amount of artwork you have show that has received accolades. I've seen your art progress over the years and am not surprised you are being honored so, at this stage of your life. You should be very pleased and proud of yourself. I wish you much more success and joy from your art. It does bring such joy when you are doing something you love and it is received so well by the world. Ashok, Thank you so very much for your support and wishes!